Creating a classroom environment of respect and accountability requires procedures, plans, rewards and consequences in your classroom. One way to keep everything flowing is to use transitions. I know from experience that the time I put into teaching these transitions and procedures is well worth the effort because then I can really focus on teaching and not managing. I teach my students to respond to my verbal or non-verbal cues to keep the lesson going. When students know how to respond to your cues it eliminates a lot of classroom chatter and keeps everyone focused and learning. Here’s some quick and easy music class transition activities to get you started. Here’s a Video of the kinds of transitions you can use in your classroom. Keep reading for the tips and freebies included. I say to my students; “Would you rather talk in Music Class or Make Music?” They all say; “Make Music”. Then I explain that when I ask questions we’re going to use our hands to show our answers. 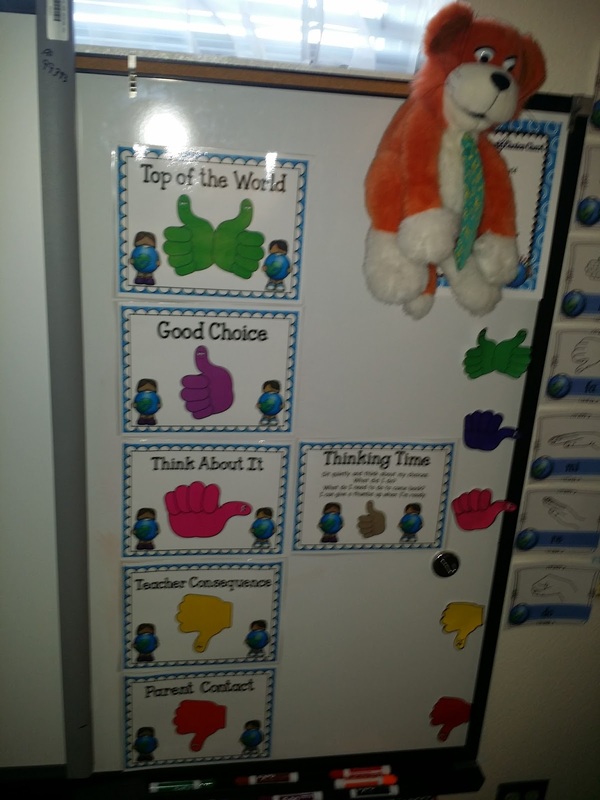 Thumbs up, down and sideways work great for yes, no, maybe answers. Double thumb up can mean, “awesome”. You’ll find a link to this FREE RESOURCE at the end of the post. How about when it’s time to line up? What do you say? What do you do? What do your students do? In my classroom I have my students stand in rows to sing our hello song. Then I sing each student’s name and the class echoes. Then that student sits down. This is how I begin all of my classes K-4. During the lesson we’ll move into a circle to do activities or games. I usually have them come back to their numbers before the end of class to recap and calm down and get ready to leave the music room. I’ll say something like this; “Three seconds to find your number.” Or, “When the song is over be in your personal space.” (I’ll play a short song on the piano)Then it’s time to line up. We practice lining up for the first 4-5 lessons. In Kindergarten and First Grade I show my students exactly where they will go when it’s time to line up. 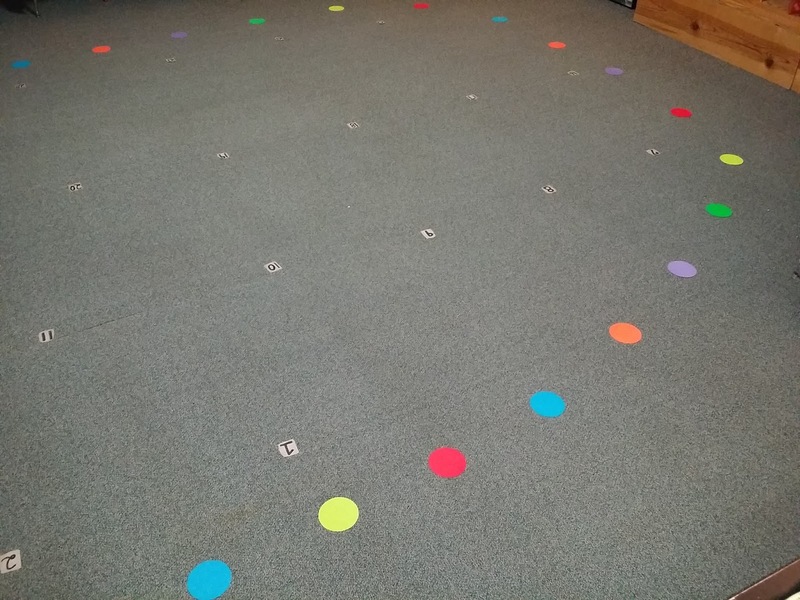 Since the students are in rows I teach them how to find a dot on the circle and to follow the leader around the room. The first person in line (whom I delegate) knows exactly where to stop and then the rest of the class lines up behind that student. We sing a little song as we march around the circle to practice this procedure. This song and many more are part of a bundle of the Music Class Essentials Teacher Resource. It’s sung to the tune of “Here We Go Round the Mulberry Bush”. Here we go round the classroom, the classroom, the classroom. Here we go round the classroom. When it’s time to line up. I use songs and chants to transition students from standing to sitting down. 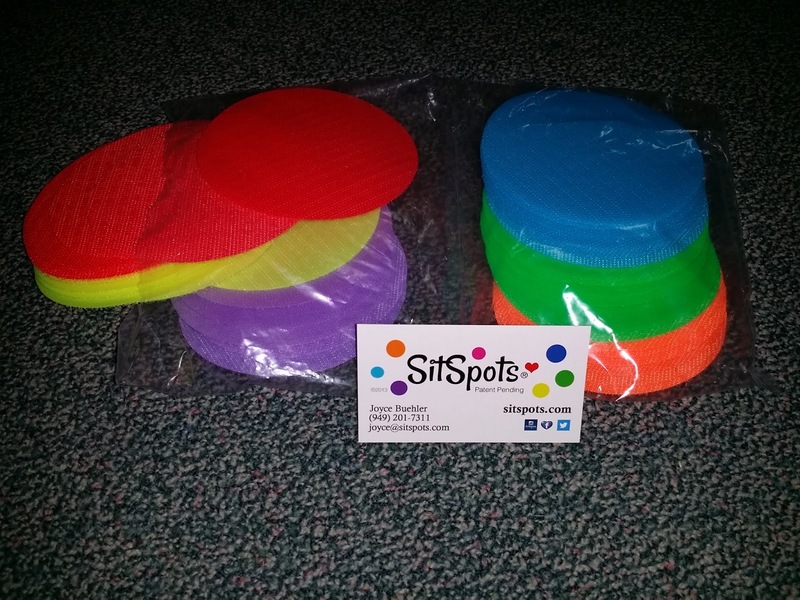 Use them to get the class quiet. Here’s a free resource with easy to learn songs and chants that will help you with transitions. I wrote this simple song to help my students transition from activities to sitting down quietly. “Criss-Cross Applesauce” is a Cute and Easy Song for students to learn. It’s now at my TPT store. to teach the song at the beginning of the year. Repetition is critical to reinforcing skills. So we practice it a lot until they can do it comfortably on their own. Then I play a game to teach my students this song. I ask them to find a friend and to talk. I tell them that I’m going to begin the song and I want them to finish it as they walk to their assigned seats and sit down. They love playing the game! Sometimes I’ll even tell them to go a little “crazy” and see if they can hear me start the song–I say I only want to begin it one time and I want to see who’s listening to my voice and who is following directions. You’ll like the 1-2-3-4 I can clap! and then SILENCE part of the song. Remember, singing helps students stay active and positive. I do all of these activities in the confines of the student’s personal space. Sometimes I will extend the activity to move around in a circle or in the room-but as a transition, I have them stay in their personal space. Most kids are in sports programs. So I will incorporate some sports like talk into my classes. You can have a lot of fun by asking the students to warm up by jogging in place. “Who can jog the fastest? The slowest?” Students respond well to jogging in place- it’s familiar. Keep it going for just a minute or two. Take a deep breath in between. This is where you can teach them good posture and breathing. By incorporating the concepts into the activity-the students don’t know you are teaching! Shoulders back, knees relaxed, hands at sides, smiling wide! Be like JELLO! Be silly! The kids love this one! I encourage them to “show me”, not “tell me” what Jello looks like. It’s important to help students learn good posture. Go over the basics, how to stand with feet not too far apart, relaxed arms, shoulders back. The rag doll helps them find the sweet spot of good posture. Let’s get loose, now bend over from the waist with knees bent and breathing! When you come up make sure your knees are bent and then come up one vertebra at a time-slowly straighten your back. Keep knees bent and finish off with- Shoulders back, knees relaxed, hands at sides, smiling wide! Feet flat, like roots going down into the ground looking for water. My arms are like the branches of a tree, reaching up to the sky to the sun. Air flows from my toes to the top of my head. Take a deep breath, blow my branches down. These are some Quick and Easy Music Class transitions that I use in between Singing and moving activities, to help students calm down after a movement activity and transition to lining up. I’m of the opinion that keeping hands and feet active creates a calmer classroom environment. Less time for redirection and more time for teaching! As you use these transitions and activities you are also encouraging good posture, breathing and getting quiet skills. Repeating the same types of transitions and activities will give students lot’s of practice so that when you perform they naturally will stand and sing with good form. Students gain the most from the cumulative effect of integrating these activities on a regular basis. Mostly, I think it’s important to come up with your own transitions, procedures and activities that will feel natural to you to do with your students. I can promise you that whatever you do, if you take the time to teach, repeat and praise them, they will respond in time. Be consistent, fair and nice and the students will want to learn from you. Please share your favorite music class transitions!